Starting this Friday, we will be open on Fridays from 9am to 4pm! See you then! Welcome to Fall! Can it really be September already? Join us this Tuesday, Sept 2 at 6:30pm for a free Demo! Karen Schwochow will be our demonstrator! We had a wonderful demo last week! If you tried the inlay technique that Sherry Baas showed us, please bring it in to share with the group! If you do, you will be entered in a drawing for a small prize! Okay! All you ladies who have asked if Cheryl would repeat her Flower Cards Class….here’s your chance to learn to make the Hydrangea and rose cards, as well as, some new ones! The class will be Saturday, September 6th at 12:30pm Fee $15 Please preregister by Sept 4th. Karen Schwochow will teach a card class featuring Masculine cards on Wednesday, September 17th at 12:30pm Fee $15. We are trying some Afternoon classes! We have had some requests for daytime classes. This will be out first. With another scheduled the next day with Marla Nejvara. Sat, Sept 20th we will have an Open House for Operation Write Home. More info on all these events will be announced soon. Many of you were disappointed when you couldn’t get into Karen Schwochow’s Black and White card class recently. Well, Karen has agreed to repeat her class! It will be held on Thursday, September 25th at 600pm (a little earlier than usual) The fee is $15 Don’t miss out again! Please, Preregister It is filling fast! Don’t forget! We will be having another Garage Sale. Save the date! I’m excited to tell you that we’ve scheduled another Garage Sale for Saturday October 11. Details on the sale will be provided in September — for now, begin to put aside those gently used items that you want to sell to another crafter. We have New Our Daily Bread Stamps. Wouldn’t you like to see one of these under the Christmas Tree? Tell Santa he can get them here! It’s Coupon week!! One coupon per person per week. Bring in the a coupon from JoAnn’s , Michaels, or Hobby Lobby for up to 40% off any one item. Coupons are not good on Machines. Coupons are not good on “held” items or special orders. I have say, I am Very,Very unhappy and disappointed to tell you that Our Daily Bread has cancelled their visit and class that was scheduled for September 20th! I know some of you rescheduled things for this event. I am so sorry. The next Round Robin will be held on Saturday, August 23 at 1230pm. The theme will be Fall. 6 instructors will each teach one card or project.Each teacher will have 15 minutes for her presentation.The fee is $20, Please Preregister.Class size is limited to 15 (Only 2 openings left!) Register now! Many of you have asked when we will be having another Garage Sale. Well, save the date! I’m excited to tell you that we’ve scheduled another Garage Sale for Saturday October 11. Details on the sale will be provided in September — for now, begin to put aside those gently used items that you want to sell to another crafter. New Stazon Ink in smaller pads! New Vertigo translucent patterned 6×6 sheets in 6 different styles! New Sweet n Sassy stamps! This Tuesday, August 12th at 630pm Suzie Barnhart will show us the new Stazon ink pads and how to use them on Vertigo translucent patterned sheets. It is a beautiful technique! Don’t miss it! Did you get one of the Perfect Layers sets? If you used it to make a card or project bring it in to share with the group and you will be entered in a drawing for a doorprize! Come join the fun! It is free! Join Karen Schwochow Thursday, August 14th at 630pm for a Black and White card class! Black and white cards are some of my favorites! This will be a great class! Fee $15 This Class is FULL. Beverly Mason will teach a fancy fold card class on Saturday, August 16th at 1230pm. Have you seen these cards before? They are Awesome! Class fee $15 Please preregister. 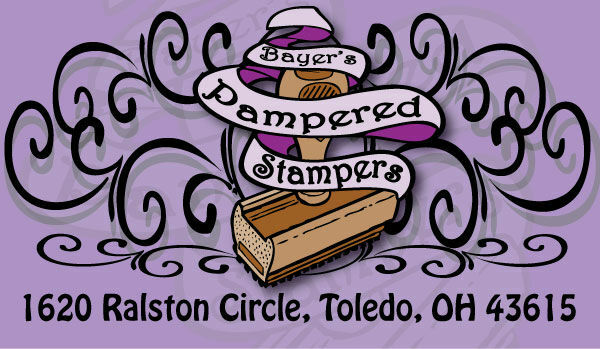 New Taylored Expressions stamp & Die sets! Impression Obsession dies and stamps (old and new) and more Our Daily Bread Stamps! Kathy Snyder will Demo “Perfect Layers” by Perfect Papercrafting, Tuesday, August 5th at 630pm.Come see what this new tool is is all about. Did you get one of the Elizabeth Crafts Pop Up dies? If you used it to make a card or project bring it in to share with the group and you will be entered in a drawing for a doorprize! Come join the fun! It is free! Join Karen Schwochow Thursday, August 14th at 630pm for a Black and White card class! Black and white cards are some of my favorites! This will be a great class! Fee $15 Please preregister. If you have already registered, and cannot come to the class on the 23rd, please contact me. I’m sorry if this has inconvenienced anyone.